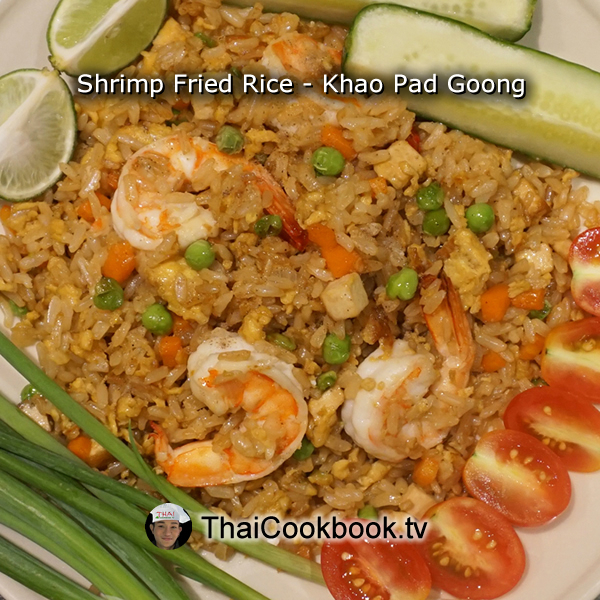 This is an extra special version of our Thai fried rice with shrimp, made with delicious whole grain brown Jasmine rice and plump, juicy shrimp. 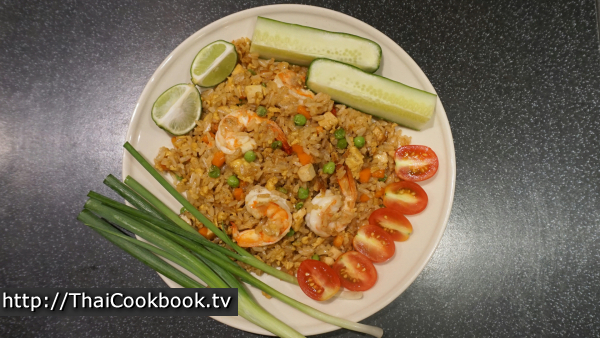 In Thailand we make a complete meal of fried rice by serving it with a variety of crisp fresh vegetables on the side. What's in our Shrimp Fried Rice. 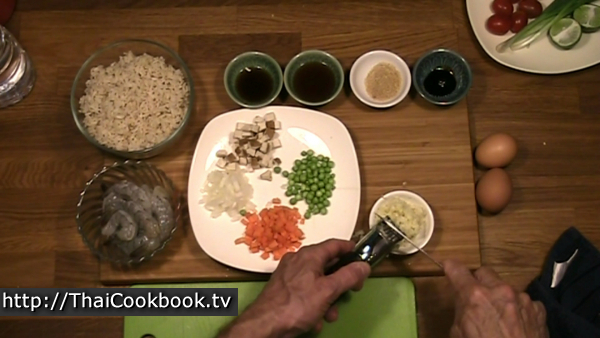 How we make our Shrimp Fried Rice. 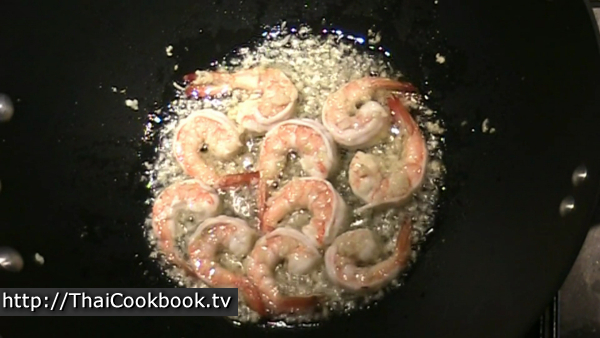 1) Lightly fry the garlic in oil for about 30 seconds, then add the shrimp. Fry them just until slightly done, then remove them from the pan. 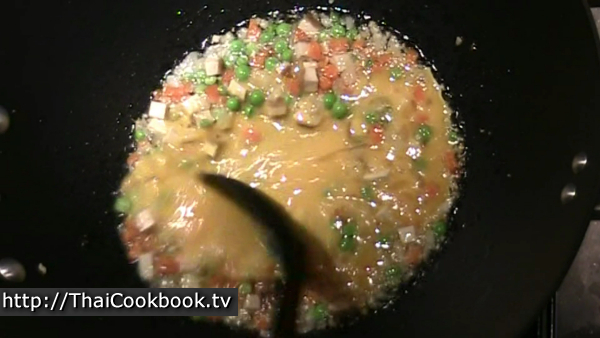 2) Fry the diced tofu, carrot, onion, and sugar peas until softened, then add the prepared rice. Turn the heat up high and fry the rice for 5 minutes, stirring and flipping, until brown and crispy in some places. 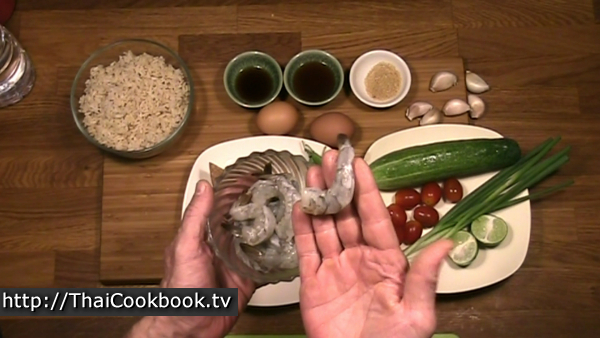 3) Turn off the heat, add the shrimp back into the rice and stir up well. 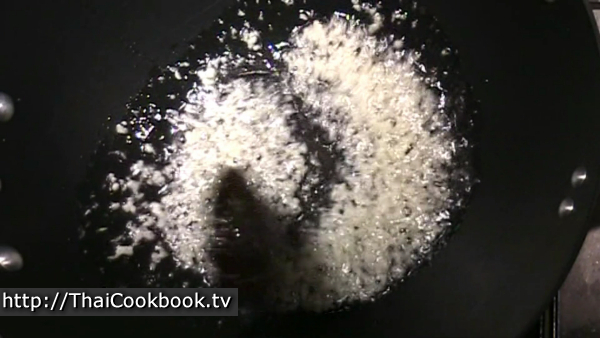 Sprinkle with finely ground white pepper. Serve with fresh vegetables of the side. In the traditional way of making Thai fried rice we use leftover steamed white rice, but today I'm using brown Thai jasmine rice. 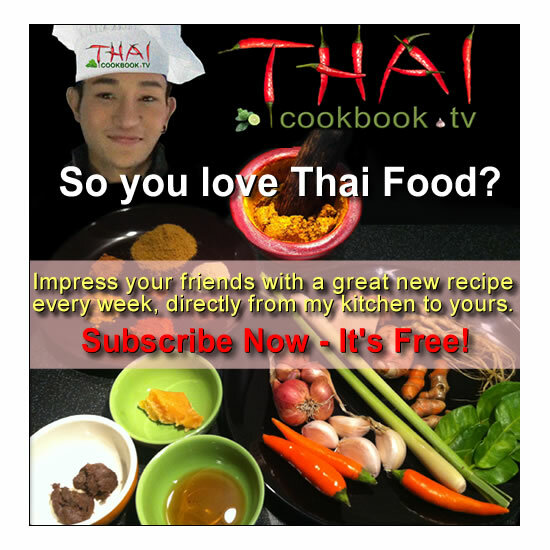 Thai people prefer white rice, but we grow a lot of different varieties of rice for export to other places. 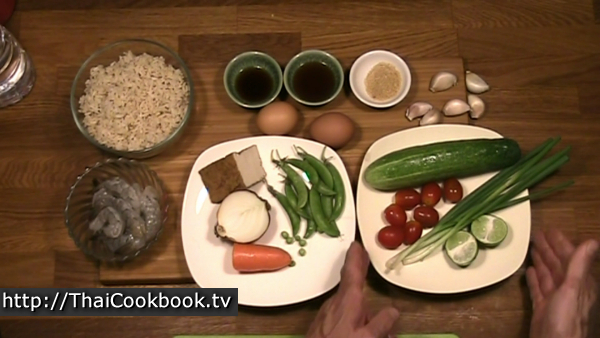 This brown rice is quite delicious and adds a chewy texture and nutty flavor to my fried rice. 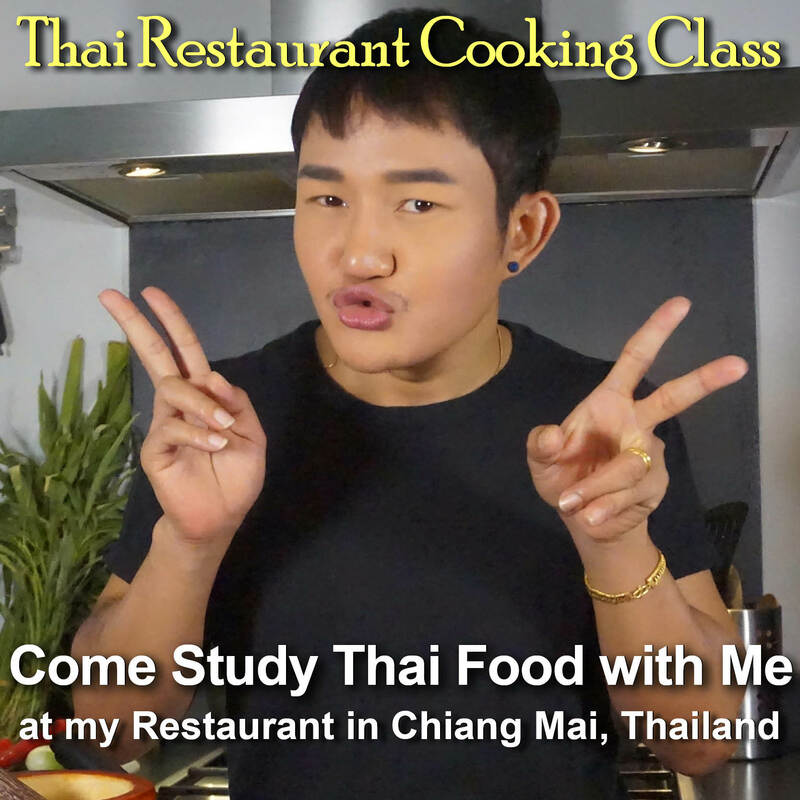 I use healthy a quantity of medium-sized shrimp so each serving will get at least 4 shrimp. Clean the shells from the tails and devein them. 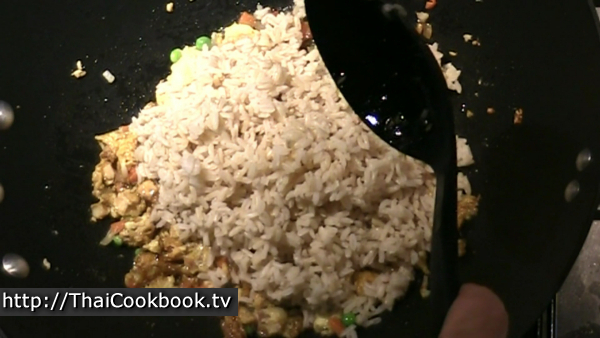 We like to serve fried rice with some crisp fresh vegetables on the side. Today I'll add cucumber, green onion, and cherry tomatoes. Fresh lime is always on the side to use as a seasoning. Dice the carrot, onion, and fried tofu. Peel the peas from the pods, and chop or press the garlic very fine. You need about 1 1/2 - 2 Tablespoons of each. Using a deep wok or large frying pan, heat the oil over a low flame so it is not too hot. You want to fry the garlic slowly so it stays nice and sweet. Burned garlic can be very bitter, so take the time and let it cook softly for about 30 seconds. Keep the flame low, add the shrimp and cook them on each side for just about 30 seconds. When they start to curl up, they are done enough. Remove them from the pan to a plate and set them aside for now. You do not want to cook the shrimp too long, so we'll add them back in at the end. Next add the carrot, onion, peas, and tofu to the oil and garlic. Once again, just saute them slowly and the flavor will be very delicious. Fry them for about 2 - 3 minutes or until well softened. Beat the eggs well, then add them to the pan. 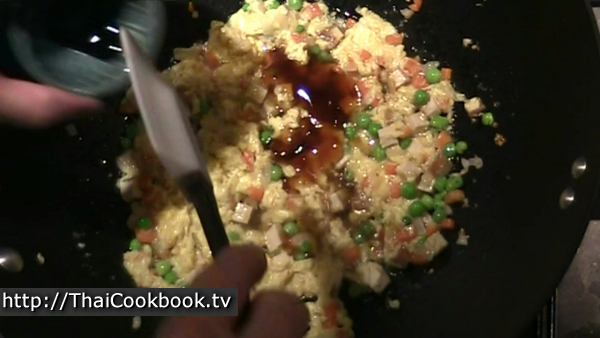 Stir around a little and let them harden well, like you are making well done scrambled eggs. Next add the sauces and sugar, and stir it all into the eggs until well blended. Fry until thick and sticky. 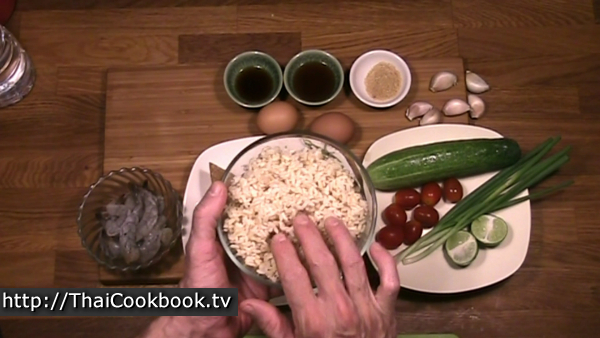 Add the cooked rice and stir it into the egg mixture. Now turn the heat up as high as you can so it all gets really hot. Fry the rice on high for about 5 minutes or so, stirring and flipping it over from the bottom. The rice will dry out and start to get crispy and browned in a few places. The more brown you can get it, the better it will taste, but watch the heat and keep stirring so it doesn't burn. 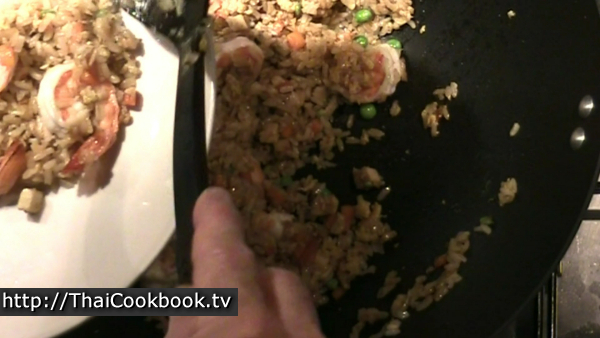 When the rice is dry and getting crispy, add the shrimp back in, turn off the heat and stir it all up very well. 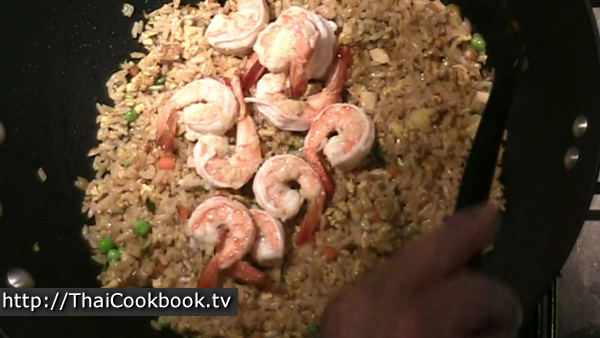 The heat of the rice will warm up the shrimp so everything gets hot without overcooking the shrimp. Serve each portion on a small plate, or put it all on a large platter to be served at the table. Always take the time to arrange the shrimp nicely on top so it all looks delicious. 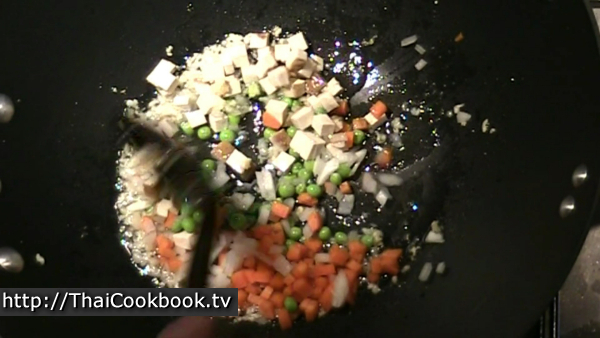 Sprinkle the top with a light dusting of finely ground white pepper, and serve with the vegetables on the side.